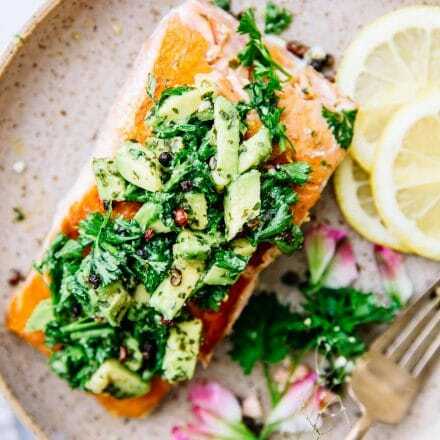 Pan Seared Salmon with Avocado Gremolata is a Whole30 compliant, healthy fish recipe. 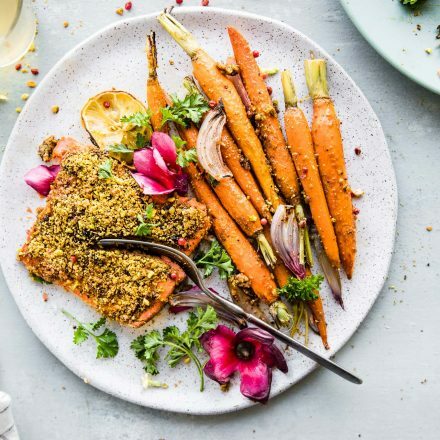 Making this crispy skin salmon requires just 7 ingredients and 10 minutes of cooking time! This is a quick, easy, kid-friendly meal. It’s grain-free, gluten-free, low carb, paleo, and using oil instead of butter, it can be dairy-free, too! FEAR NOT my “I don’t know how to cook fish” friends, because this post is for you! And by the end of it, you’ll be able to make a delicious (fancy looking) fish dish in 10 minutes flat. No really! 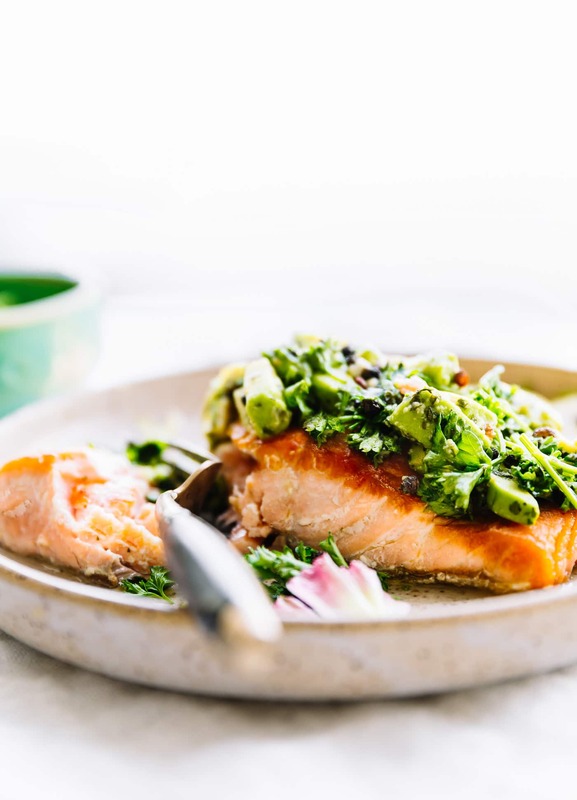 This 10-Minute Pan Seared Salmon with Avocado Gremolata is what I call a “faux fancy” dish. Why? Because it looks fancy but it’s not. In fact, it’s made with just 7 ingredients and large pan. Yup. SO SO EASY! Will you trust me?? Ok cool. Keep reading. First, let’s talk about pan searing fish, salmon to be exact. And why the skin should be left on. Is it safe to eat the skin of fish? If you don’t already know, there are a lot of unhealthy chemicals and pollutants in the open waters. Those chemicals (called PCBs) absorb into marine life, so not all fish skin is safe to eat. The good news is, wild-caught salmon (and other wild fish) are free of pollutants, so the skin on those fish is perfectly safe to eat. Plus, just like salmon flesh, the skin of salmon has healthy omega-3 fatty acids. Our bodies don’t produce those fatty acids, so we need to eat fatty fish to get them. Moral: eat more pan seared salmon! How do you get crispy skin on fish? You can get a nice, crispy skin salmon by grilling, broiling, or pan searing the fish. For some reason, there are people who find pan searing salmon intimidating. I’m here to tell you that you have nothing to fear – making pan seared salmon is SO easy! Better yet, pan searing salmon is one of the quickest ways to make a healthy fish dinner. No need to heat up the kitchen with the oven and no standing over a hot grill – less than 10 minutes of cooking time on top of the stove is all you need to make pan seared salmon! Alright, we have mastered the art of pan searing, yes? Now, let’s fancy it up with an EASY gremolata. 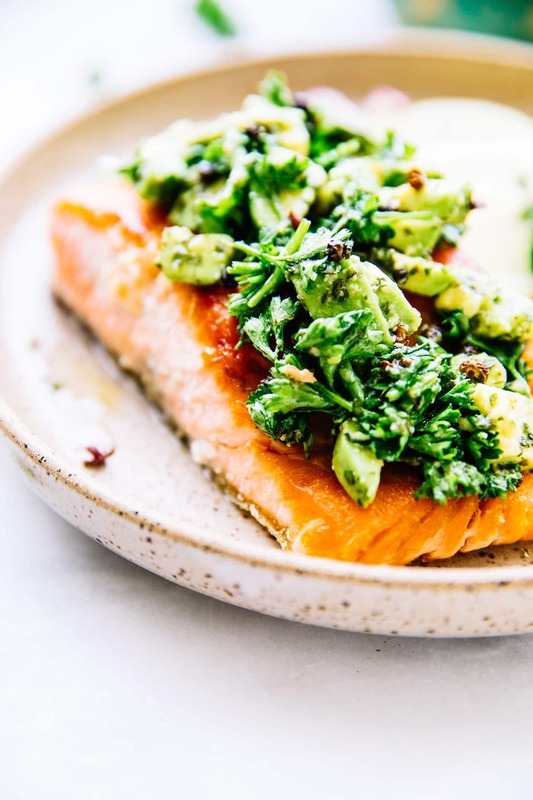 Because there is no such thing as having too many healthy fats, I decided to top the salmon with fresh avocado, in the form of avocado gremolata. Cotter, you sound so so fancy-pants. What is gremolata? Gremolata sounds fancy, but it really isn’t – it’s just an Italian name for a deliciously simple condiment made with fresh herbs, oil, garlic, and lemon zest. It’s similar to pesto, but traditional pesto is most often made with fresh basil, while gremolata has fresh parsley. Or what I like call the easiest and most delicious topping EVER! You’re welcome. Either way, the fresh, citrusy flavor and bright color make gremolata the perfect topping for a fillet of fish, steak, or even cauliflower steaks. And it’s oh, so pretty!! To make the avocado gremolata, all you need to do is invite some diced avocado to the party. 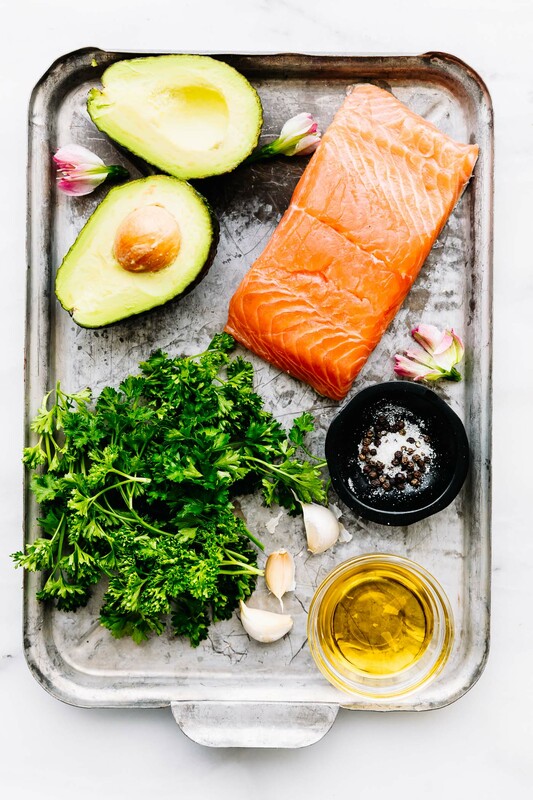 So, let’s recap this healthy pan seared salmon with avocado gremolata, shall we? HEALTHY – Crispy skin salmon fillets – wild salmon packed with healthy fatty acids, and the skin is safe to eat. 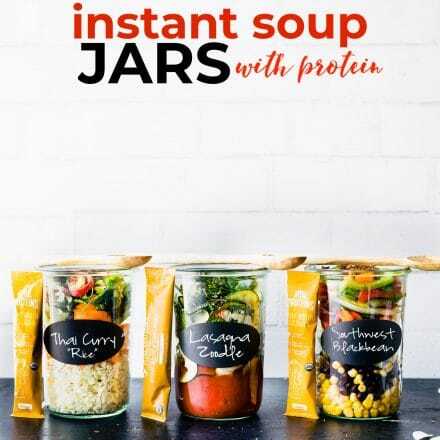 Kid-friendly and free of grains and dairy. EASY FISH RECIPE – Less than 7 ingredients, cooked in one pan. FREAKY FAST – A 10-minute meal – for real! It will probably take you longer to set the table than it will to make pan seared salmon for dinner. 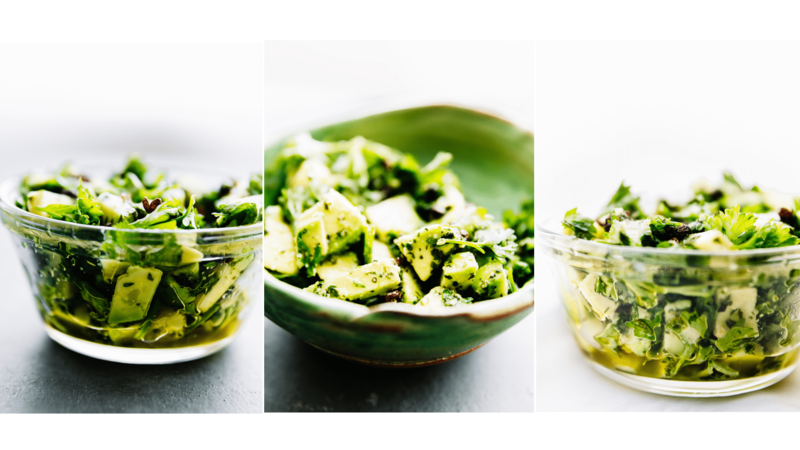 GORGEOUS and FRESH – Avocado gremolata, I’m looking at you. But wait, I’m not done with you yet. 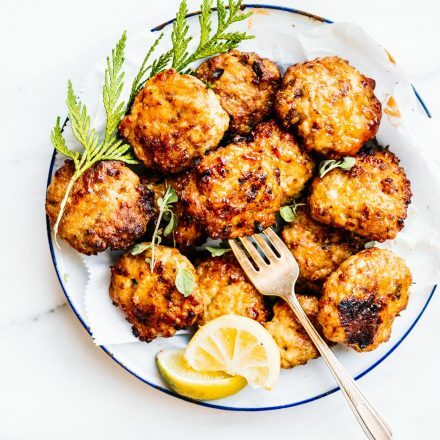 Here are more EASY fish recipes for you to try because….. If you love pan seared salmon and want more EASY healthy fish recipes, you’ll LOVE these! 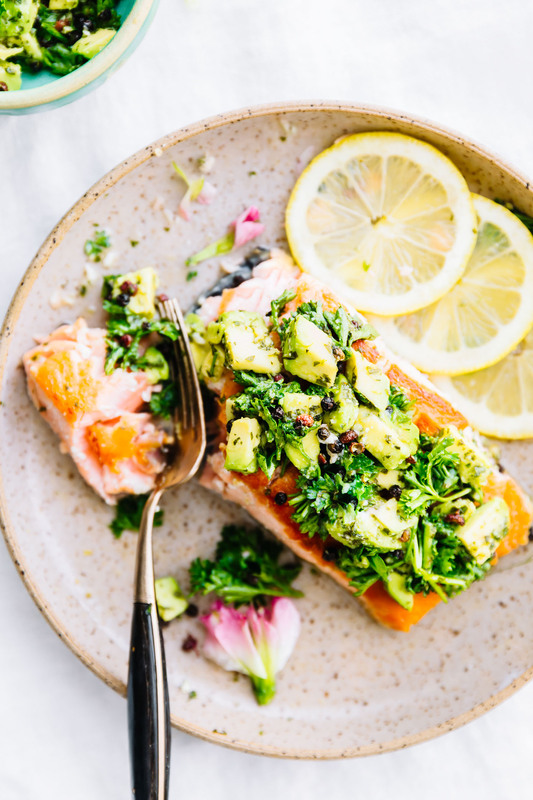 Pan Seared Salmon with Avocado Gremolata is a Whole30 compliant, healthy fish recipe. Making this crispy skin salmon requires just 7 ingredients and 10 minutes of cooking time! This is a quick, easy, kid-friendly meal that’s grain-free, gluten-free, low carb, paleo, and using oil instead of butter, it can be dairy-free, too! 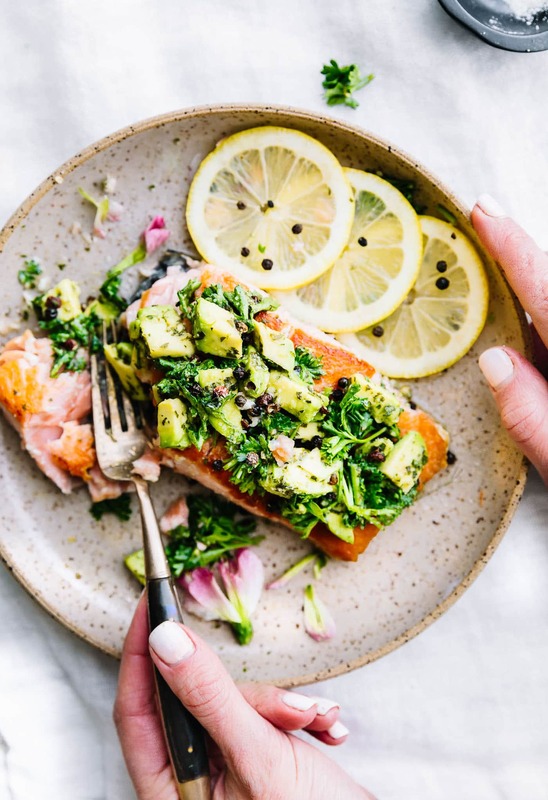 Before you begin – You can make the gremolata first before cooking, or quickly make it while the salmon is sitting after being cooked. It takes 2 minutes to make! Instructions below. First clean your fish fillets with fresh water. Pat dry on both sides. Heat a large skillet over medium-high heat. When the pan is hot, add butter (or oil) and swirl until pan is covered or butter melted. Add the salmon fillets to the pan, flesh side down. Pan sear the salmon flesh side down for 3 minutes, then flip with a spatula or tons to sear the skin. If your goal is a super crispy skin, use a flat spatula to gently press down on the flesh until the fillet flattens out a little more, sealing the skin against the pan. When the flesh feels firm to the touch (3-5 minutes), the salmon is ready. Depending on the thickness of your fillet, the searing time could take longer. Check to make sure the inside is no longer pink but opaque. Remove pan from heat and cool the salmon in the pan for 2-3 minutes. The salmon should continue cooking (a tad) off the heat. Sprinkle the flesh side of the fillets with a little salt/pepper. Top with lemon and avocado gremolata, serve, and enjoy! Chop your avocado and herbs. Mix all ingredients together in a small bowl and let it marinate in the fridge while the salmon cooks. Alright friends, let me know if you try pan searing! I think you’ll be impressed once you do. 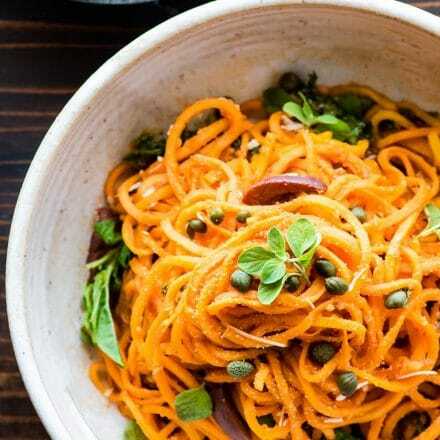 p.s this makes a great meal prep dish for the anti-inflammatory challenge. Just sayin… hint hint. Oh my…this is what quick dinner dreams are made of! WOW! Looks so fresh and delish! That dish looks so good, and so colorful! Throw an avocado on anything and I’m happy! But this whole thing would make me happy! 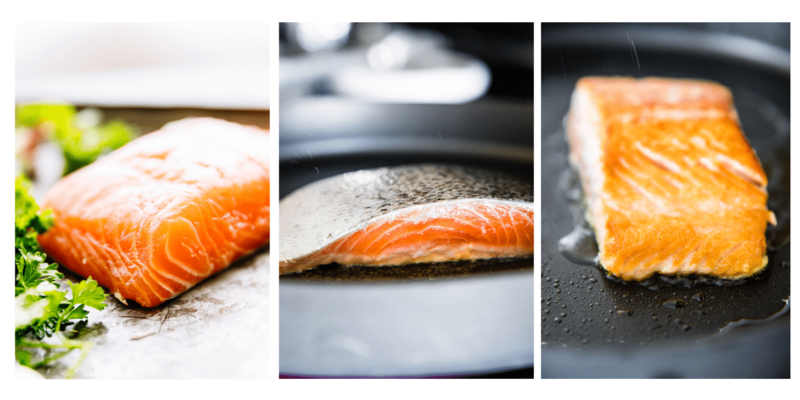 I just love how quickly you can cook salmon by pan searing! Not only that, but there’s something about the flavor that is so much better to me. The avocado topping here is to die for! Are you sure that we can eat salmon fish skin? As am trying it for the first time in my life and just like you said, not all fish skins are safe to eat. I would not eat the skin unless it was a sustainable wild caught source, just to be safe. And to be honest, the skin is only good fried. Haha!